Not really a road trip, but my brother has been nagging me to go on a cross-country Amtrak trip with him. We'd catch the train at Cincinnati, then ride to Chicago, where we'd change trains and hop on the Amtrak train that goes west through Illinois, Iowa, Nebraska, and on to the Bay Area. He wants to fly back to CVG, but since I'm not too keen on flying, I'd prefer to rent a car one-way and drive back to Kentucky. There isn't really a site to easily track which counties Amtrak goes through. Best bet is to do (and what I did with my Empire Builder trip 3 years ago) is just log the trip then go back and see which counties it went through. 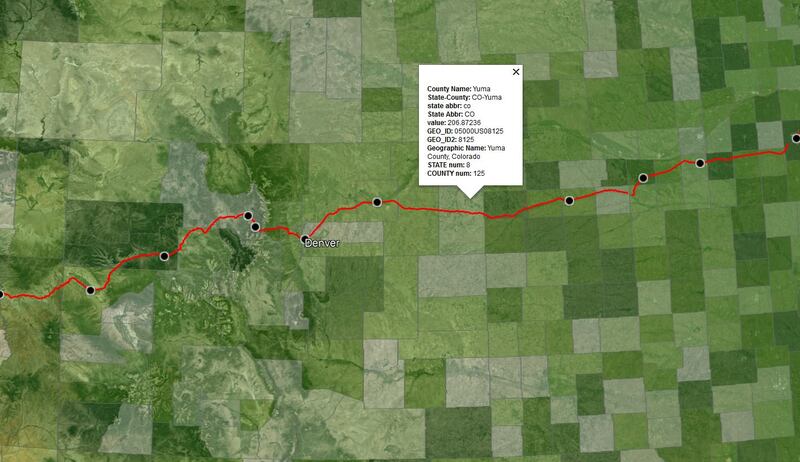 Or you could follow the rail lines the Zephyr follows on a mapping service that includes counties (like OSM or Bing). Amtrak's own trip planning site will show the routes, but since it uses Google Maps as the background will not show you the counties. If you can figure out which rail line Amtrak follows, it should be possible to follow line in the mob-rule overlay or Google Earth as well. Google Earth would probably be easier as rail lines are rendered in it with bold black lines rather than the narrow, gray, and only visible at certain zoom level ones that Google Maps uses. No need for all of that. Sometimes, though (and I haven't checked if it's the case here), the lines it provides don't follow the tracks. They're just straight lines that connect the stations. EDIT: I checked, and it has indeed been fixed, at least on some routes. If you go to openrailwaymap.com you can find a map of the entire railway network with the names of the lines labeled (railroad sections have names just like highways have route numbers). Then go to the wikipedia article for the train and it will list the various sections the train uses. Then you can get the counties from any good map of the states by county. BTW, the Cardinal leaves Cincinnati at 1:30 in the morning. It won't cost you much more to use Ashland, which is at a more civil hour. I've found the straight-line approach to be more common with bus than with rail. Given HB's description, they're probably leaving from Cincinnati because his brother wants to fly back to CVG. Can't do that as easily leaving from Ashland. Yes, he lives in Owen County (center of the "golden triangle" of Lexington, Louisville and northern Kentucky). I can't speak to any of the rest of the country, but I rode the Texas Eagle for about 12 hours within Texas and I was amazed at how much road-geeking there was to do from the train. So many old/abandoned routes and abandoned bridges to see. I brought books and tablets but I never had the slightest inclination to do anything but watch the scenery for more cool finds. I hope the experience is similar for your trip. Maybe someone at on-track-on-line.com might know the answer. They have a railfan forum; I'm not a member, but from a glance it appears to be an active forum. The website itself doesn't appear to be updated as regularly as one might like, but the forum looks active. If you're using the Mob-Rule layer in Google Earth (or this KML county map from Google), it would be best to pair it with a KML trace of the rail line from Wikipedia. The California Zephyr's is here. You just have to paste it into a blank text file, save it as a .kml, and open both files in Earth. It was when I rode Amtrak up and down the east coast in the early 2000's. *Most of the Port Chester Branch of the former New York, Westchester and Boston Railway. *The Cedarhurst Cut-Off south of Springfield Junction. *The LIRR Central Branch west of Floral Park. *The former Flushing and North Side Railroad Woodside Branch. They did however had another branch of the Old Put in Yonkers that I never knew about, and an extension of the White Plains branch of the NYW&B that extended beyond White Plains into Westchester County Airport and Connecticut. I'm trying to list some of the stuff I found out about Central Florida, but I'll have to get to that later.